These young gentlemen probably missed the Sunday School lesson about two wrongs not making a right. We wrote an article, ‘Five Prepper Lessons from the St Louis Rioting and Looting‘ on Tuesday of this week, after the first two nights of unrest following the police killing of a youth in Ferguson, a suburb of St Louis. The first night of looting was relatively uncontained, while the second night saw a massive police presence that largely kept order throughout the area. We thought/hoped that would be the end of the uncontrolled senseless violence part of the response and reaction to the police shooting. Now that we have had four more nights of experiences, do these lessons need to be revised? For sure, since that time, the rhetoric has escalated several notches, and what appears on the face of it to have been a totally justified police shooting is being painted as anything but. Let’s first look at what is currently known about the initial encounter. Tragic Accident? Justified Shooting? ‘Suicide by Cop’? Or a ‘Racist Execution’? As best we understand the circumstances, a single police officer stopped two youths who were walking down the middle of the highway and interfering with traffic. The youths matched the description of two people who had just robbed a nearby convenience store, and one of the two youths may have had a box of (stolen) cigars in his hand. The officer decided to arrest them and take them back to the station. At least one of them resisted arrest, a struggle ensued with the youth trying to take the officer’s gun from him. Fearing quite appropriately for his life, the officer shot the youth. Much has been made of the fact that the youth was shot apparently six times. But if you know anything about self-defense, you know that when you are struggling for the control of your weapon, when you’re outnumbered, and when the other person is coming on to you, you don’t just fire once, then stop and see what happens before carefully considering a second shot. You also know that pistol bullets are woefully inadequate and some people have continued in a fight after being hit a dozen times. So, you fire as quickly as you can until ‘the threat has ceased’. Those six rounds were probably fired in little more than a second. This wasn’t a cold-blooded execution, it was a panicked act of self-defense against a gratuitous attack, by an officer who credibly was in fear of his life. It is important to also appreciate that the assailant was 6’4″ and 300 lbs. Based on published photos, the officer appears to have been of average height and something under 200 lbs. It seems he had already suffered appreciable injuries from his struggle with Brown. He had no choice but to resort to his firearm in this scenario – but these facts are not interfering with the public outcry blaming the police officer. Furthermore, the autopsy shows that four of the rounds hit the assailant in the arm. They would not have stopped him. The officer needed to continue firing. None of this needed to happen, if the youth had simply cooperated with the police officer. The event was as much ‘suicide by cop’ as anything else. The youth brought the consequences completely on himself. Even the stupidest of gangbangers knows that if you resist arrest and attack an outnumbered police officer, and particularly if you try to take his gun from him, then you’re almost guaranteeing a lethal response on the part of the police officer. End of story. However, our point is not about what to do when you are stopped and subsequently arrested by the police, because there’s no need to write that story. It is dead simple – you cooperate. By all means stand up for your rights, but don’t inflame a situation that is always tense for every police officer. Even if the police are in the wrong, you cooperate during the interaction with the patrol officers and then you have a chance subsequently, through the legal system, to right any wrongs that occurred. If you don’t cooperate, you will definitely have some valid additional charges added to your charge sheet by the police, and your own reciprocal complaints will be tainted by your inappropriate actions, making you a less sympathetic victim. Oh yes, and if you really misbehave, you have a good chance of being tasered, or possibly even shot. Back to our five lessons. We’d like to amplify two of the points we made before. Our first lesson was to be aware that people around you may act unexpectedly and irrationally, and not in ways that mirror our own views and values. When we stated that on Tuesday, our focus was on opportunist mobs who would gratuitously attack and destroy your property. But there’s another part to that risk which has become increasingly apparent as the week has continued. Not only have the mobs continued their reprehensible looting, whenever they think it to be safe and they can get away with it, but their actions are being justified by other groups in society, and the initial event that started everything, rather than being a somewhat sad example of a stupid lawbreaking youth suffering the inevitable consequences of his actions in fighting with the police officer, the story is now being painted as a racist cop gratuitously ‘executing’ a harmless young lad. The local community is up in arms (almost literally) about this, they are defending the undefendable, and they are being encouraged and joined by all the usual professional agitators and disruptors. What does that mean for us preppers? We’ve written before about how, in a level two or three situation, we need to fear not only gangs of lawless looters who might attack us and our retreats and try to take everything we have. We also need to fear the ‘law abiding’ people around us. They will also gang up, but perhaps not violently, but instead in a civilized way, and rather than attempting to attack us ‘just because’, they will send duly appointed officials to deprive us of everything we have, the same way a gang would, but under the color of law. Court officers, bailiffs, and any/all police and other law enforcement and emergency agencies may create, validate, and then enforce mandatory sharing of ‘vital resources’. We write about the very real danger of this in a three-part series – Preppers Beware : Our Hoarding Can be Deemed Illegal. 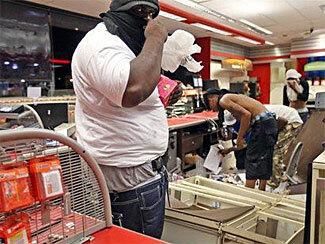 Fortunately, it is possible to fight off the occasional ‘one off’ lawless band of looters who attack your retreat. But we’re not so sure how possible it will be to attack the FEMA/HSD/etc officials who come to effectively do the same thing. If people can delude themselves into believing that the police officer was in the wrong in this recent event, how hard will it be, when they are starving, to delude themselves that you are in the wrong by seeking to protect yourself and your fellow retreat members, and demand you share your supplies with them. Preppers often wonder what to expect when TSHTF. We can never know for certain, but we can look at analogous events and try to see possible parallels. The St Louis riots, and the way large portions of the population have rationalized things, ignoring the reality and instead bending the facts to fit their self-serving viewpoints (or ignoring the facts entirely) does not encourage us to support the idea of mankind’s inner nobility and higher values asserting themselves in a high stress situation. The sixth ‘bonus’ lesson we offered was that you can’t rely on the police (to come to your aid, that is). Now, possibly, it could be said, in an attempt to excuse the lack of police presence on Sunday – the first night of rioting – that the police were unprepared and didn’t know what to do. But how about later in the week, such as on Friday? What excuse applies then when you read about situations such as this, where store owners dialed 911 but couldn’t get any police resource of any sort to come to their aid, and where other store owners saw squad cars driving by looters who were actively in the progress of looting? The lack of response wasn’t due to the police being overworked and with too many different emergencies all calling on them simultaneously. It seems the police made a political decision to do nothing and instead let the riot ‘burn out’ on its own, without adding new ‘provocations’ and inciting the rioters still further. Don’t be surprised by this. A passive non-response, limited merely to efforts to contain the worst of the lawlessness, seems to be the standard approach adopted by police departments in most parts of the western world when rioting rages around them. Maybe it is even the right response. We can simultaneously understand that position, while also being outraged by it. A passive non-response for all but the most egregious acts of violence may indeed allow for a de-escalation of tensions and a return to ‘normalcy’ (whatever that actually is). But how do you think the individual store-owners feel about this, finding themselves being sacrificed for the hopefully greater good of the region as a whole? Did they agree to that? Are they not entitled to protection and for the impartial enforcement of the laws? And what message does that send to the rioters and looters? Doesn’t it affirm the validity of their actions, and encourage more lawlessness in the future? Is this the new standard of law enforcement : ‘We’ll enforce the laws, but only as long as doing so doesn’t anger the criminals’? And what does this mean? Do we give in to acts of domestic terrorism? Yes, you’ve not heard the riots described that way, have you, which is in itself a telling omission. If it were right wingers complaining about blacks, don’t you think they’d have been smeared with every racist epithet known to our left-wing press. But because it is predominantly blacks rioting against whites, we have to ‘cut them some slack’. If you or I threw a brick through a shop window, and a policeman saw us, we’d be in the slammer faster than we could spit. But if 100 or more of these lawless rioters do the same thing, the police hold back. 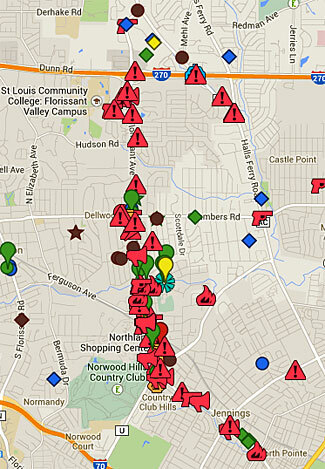 Now ask yourself what will happen if a more lawless situation engulfs not just a couple of suburbs of St Louis, but instead, an entire county, state or region of the US, and if there is no obvious source of immediate help. Do you think the police will come to your aid if your home and business are attacked, or will they hold back? Especially if they know they do not have a nearly inexhaustible supply of reinforcements available at the other end of their radios. So, we see three clear lessons from the extended St Louis situation. It only takes a small spark to start a large conflagration, to cause lawlessness to break out across the board. People will act in selfish self-serving manners without any rational constraint, and will readily justify to themselves everything they do, no matter how extreme it may be. The police will capitulate. They may concentrate on writing parking tickets in any remaining safe districts, while entirely abandoning lawless regions and leaving the people in them to save themselves. Or, if things turn really grave, they may well take off their uniforms and join in the looting. If you are a prepper, you have decided to plan and prepare for possible adverse future scenarios, in a manner so as to ensure your own continued survival. We all have different views about what these possible adverse scenarios may be, and how best to plan and prepare for them. We can’t know for sure how any specific circumstance may unfold. So the best thing to do is to learn from past events, and the more recent the past event, the more valuable. We’ve set out the lessons we’ve drawn from the St Louis situation, here and in our earlier article. You might agree with us, or maybe not. But don’t ignore this entirely. Carefully consider what has happened, and what it means for possible future scenarios, then make sure that you modify your own preparations accordingly. As for us, we’re going to double down on getting to know our neighbors, and very gently encouraging them to a point where if things become dire around us, they are more likely to stand beside us to enhance our shared best interests and mutual survival. On the other hand, the tree-hugging aging hippies on one side? Well, that’s a story for another day….. Bigger is not always better with binoculars. One of the most useful pieces of ‘force multiplying’ equipment in your prepper kit is a good pair of binoculars. Unfortunately, many people have little idea of what makes a pair of binoculars good or not so good, and with mass marketed binoculars usually being low quality, few people appreciate how helpful a good pair of binoculars can be when it comes to boosting your range of vision. Furthermore, very few of the many different models of binoculars come anywhere close to meeting the requirements of a ‘good’ pair of binoculars, and so by statistical chance alone, most people end up having bought a poorly performing pair of binoculars. There are many things to consider when choosing a pair of binoculars. But these various issues are all easy to understand, and unlike evaluating high-end audio gear, for example – it is easy to tell if the binoculars you are considering are ‘good’ or ‘bad’. There are two major categories of binoculars to choose from. One type is what we’d term ‘straight through’ binoculars (their official name is ‘roof prism’ binoculars) and they are distinguished by having more or less straight tubes from the objective lens (the big lens that faces towards what you are looking at) to the eyepiece on each side. These binoculars also look similar to a third type of binocular, known as ‘Galilean binoculars’, but you’re unlikely to see them when looking for prepper type field binoculars and so we will pretend they don’t exist. They are most commonly seen as opera/theater glasses these days. The other major type is what could be termed ‘offset’ binoculars and which are more properly named Porro prism binoculars. These have the eyepieces closer together than the objective lenses. There are several reasons why we recommend you consider only offset type binoculars. They can have larger objective lenses (read on to learn why this is important), they allow more light to pass through than roof prism binoculars (making for brighter images, particularly important in low light and night conditions) and the greater distance between the two objective lenses helps improve the stereoscopic perception and awareness of distance. They also tend to be smaller in length, because the optical path travels in a sort of letter ‘Z’ through them rather than directly through them. Note that there are also some very stupidly designed ‘reverse Porro’ binoculars, where instead of having the objective lenses spaced further apart than the eyepieces, they ‘zig in rather than out’ and are closer together than your eyepieces. You will get less 3D depth perception with these, and we totally do not recommend them. How Powerful Should Your Binoculars Be? By ‘powerful’ we mean how many times magnification your binoculars may offer. The answer to this question tricks a lot of people, including my parents, many years ago. I remember as a young boy I desperately wanted a pair of binoculars, and so my parents gave me a pair one birthday. Bless them, they wanted to get me the ‘best’ set they could, so they got a pair with 12x magnification. But they did not understand that more magnification was not synonymous with better. A 12x magnification was too much for hand-held binoculars. The greatly magnified images jumped about too much and it was unpleasant to use the binoculars without some sort of steadying support. So, to my parents’ surprise – and possibly to your surprise also, there is such a thing as ‘too much’ magnification. On the other hand, there’s little benefit to get a pair of binoculars that only offers two or three times magnification, when there are perfectly good binoculars offering more than twice as much magnification. To make a potentially long story short, the best compromise for portable handheld binoculars, between too much magnification making for too unstable an image, and too little magnification making for less overall value, seems to be at the seven or possibly eight times magnification. Our earlier discussion about magnification assumed we were talking about a portable pair of binoculars that you would want to be able to use without the need for support. If you are instead considering a pair of binoculars that could be mounted on a stand or tripod or other stable platform, and if weight issues are also not so relevant, then there is no reason not to consider more powerful binoculars. In such a case, by all means get any power you feel appropriate, while noting that if the ratio between magnification and objective lens diameter gets too small, their value as night glasses will diminish appreciably (explained below). Don’t go wild and crazy, particularly in a fixed OP. In such a case, you know what vision ranges you need. Maybe there’s a tree line a couple of hundred yards away, or a rise/fall in land that limits your vision. You’re unlikely to want or need to be able to clearly see the buttons on a guy’s jacket a mile away, and if you do have that need, then you should use a special purpose telescope rather than binoculars. Talking about magnification, you can also get zoom binoculars which might give you a magnification range from perhaps three or more times up to some massively greater number – indeed, we’ve seen zoom binoculars offering beyond-crazy maximum zoom capabilities, sometimes in excess of 100x. The chances are your camera has a zoom lens, so you know how great they are. So doesn’t it make sense to have a zoom function on your binoculars, too? The answer to this is a very emphatic ‘No!’. There are several reasons why zoom technology – so brilliantly wonderful on a camera – does not translate well to binoculars. First, remember that any magnification greater than about 8x starts to become problematic from the perspective of keeping the image stable while hand-holding binoculars unsupported. Second, greater zoom ranges start to get an inappropriate ratio between magnification and objective lens diameter (see below). Third, a zoom lens has a lot of optical compromises in it. These can be electronically processed out in a camera, but will be visible and problematic in a pair of binoculars. The extra lens elements in the zoom will also add to the weight of the binoculars. Fourth, remember that a pair of binoculars has two independent ‘telescopes’ that are joined together. If you have a zoom capability, the zooming has to work identically in each ‘telescope tube’; if it doesn’t, then your eyes will be stressed and will lose the ability to merge the two images into one single image in your brain. We’re unaware of any zoom binoculars on the market today with sufficient build quality as to avoid this problem. Fifth, a zoom lens has a much narrower field of view, particularly at lower magnifications, than a regular lens. This makes it harder to quickly point your binoculars at something you saw in the distance and be sure you’re pointing in the right direction, and also reduces the amount of situational awareness you’ll get because the area you are monitoring has shrunk. We could probably come up with some more disadvantages too, but surely this is enough for you. Don’t get a pair of zoom binoculars. Well, actually, here’s one final consideration. Because zoom binoculars are a gimmick that ‘serious’ users would never select, it seems that the leading manufacturers of binoculars don’t bother making them, so you’re restricted to lower quality suppliers of a product that is incapable of ever being high quality to start with. If you hold a pair of binoculars away from you and look through the eyepieces, you’ll notice that the image appears as a small circle within the broader eyepiece lens. Here’s a key consideration. You want the size of that small circle to be at least as big as the size of your eye pupil (the black circle in the middle of your eye). Now, as you know, your pupil changes in size – in bright light, it gets smaller, and in dim light, it gets larger. You want the size of the image to be bigger than the biggest size your pupil ever gets. If it is smaller, then you are defeating the whole purpose of your pupil growing in size to admit more light in low light conditions. On the other hand, if it is bigger than your pupil, there is no harm done at all. Another benefit of a larger viewing image is that it makes it less critical to exactly center the eyepieces on your eyes, because even if your eyes and pupils are a bit off-center (compared to the binoculars – the ‘interpupillary distance’), they are still being fully exposed to the image within the eyepieces. An adult’s pupil grows to about 7mm in diameter in low light (and as we age, it shrinks), so you want these circles to be at least 7mm in diameter. Now – how do you know what size the circles are (other than measuring them)? Happily, this is very easy to calculate. Divide the diameter of the objective lens (the big one that faces towards what you’re looking at) by the magnification power, and that tells you the diameter of the image your eyes see. For example, a set of 8×24 binoculars would have a tiny 3mm diameter image in each eyepiece. 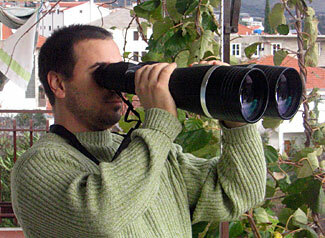 Remember we said you should get binoculars with seven or eight times magnification? Well, multiply those numbers by 7 to get the necessary objective diameters such binoculars should have – at least 49mm in the case of seven times magnification, and at least 56mm in the case of eight times magnification. This is why the 7×50 binoculars have become pretty much the ‘gold standard’ and optimum compromise point for serious professional grade binoculars. A pair of 8×56 binoculars would be slightly better in terms of magnification, but they’d also be appreciably heavier (the lens would have to be 30% bigger and overall, the binoculars would start to become too big, bulky and heavy for convenient use). Binoculars have a varying field of view, depending on their design and magnification. The field of view relates to how wide an image you can see, and is generally specified either in terms of degrees, or in terms of how wide an image you get at a specific distance, for example, perhaps you might be looking at a pair of binoculars that offers a 5º field of view, or a 262.5 ft field of view when looking at things 1000 ft away. To convert from degrees to feet (at 1000 ft) simply multiple the degrees by 52.5 (or divide the feet by the same 52.5 factor). If you’re being quoted so many feet at 1000 yards, divide by 157.5 to get degrees (or divide by three to get feet at 1000 ft). The wider the field of view, the easier it is to get sighted in on something, the easier it is to track fast-moving objects, and of course, the more you can see simultaneously. The bigger the better for this parameter. But remember that, in general, the greater the magnification, the lower the field of view. Normally it is not appropriate to sacrifice magnification for field of view. Decide the magnification you want first, then get the best field of view available for that magnification second. If you have a heavy-duty budget for binoculars, you might be interested in considering a pair that offers image stabilization. These are exactly as the name implies – they have built-in stabilizers that steady the image by adjusting the optics, and so allow you to enjoy handheld stable images with much greater magnification. So that’s a plus. But there are minuses. As preppers, we want to have high quality but ultra-reliable gear, and adding all the micro electronics and electrical stuff that goes into image stabilization greatly increases the likelihood of sooner or later, something going wrong. If the stabilization fails in a bad way – ie, one lens out of alignment with the other – then the binoculars become useless. The image stabilization also requires battery power. That’s probably not a deal breaker by itself, but it’s another pinprick of aggravation and hassle. You’re probably also looking at another pound or more of weight because of the extra stuff inside. The biggest argument against them though is that unless the objective lens diameter has grown in size to match the increased magnification, you are getting something that works only in bright light and which becomes increasingly useless in dimmer light. We suggest you don’t buy an image stabilized pair of binoculars. Spend the money on a truly high quality pair of standard binoculars – indeed, maybe you can even buy two pairs of standard binoculars for the same cost. Maybe you’re not planning on dunking your binoculars in the ocean. But how about using them in the rain? A waterproof pair of binoculars will of course be more resistant to rain effects and humidity, as well as to accidental immersion in puddles or anything else. Most higher quality binoculars are waterproof, indeed, let’s simply say that if the binoculars are not waterproof, then who knows what other design compromises exist, so don’t buy them. As you probably know, there are varying degrees of waterproof capabilities, often expressed in terms of how many minutes at what depth of water can be withstood. So don’t just assume that all waterproof claims are of equal validity – some will probably be better than others. As well as claims about being waterproof, some binoculars claim to be fogproof. This means they have probably had their interiors pressurized with moisture free nitrogen. All fogproof binoculars are necessarily waterproof too, but not all waterproof binoculars are also fogproof. There are three types of focus offered on binoculars. The simplest is a fixed focus that you can’t adjust, whether you want to or not. The next most simple is a single or central focus knob that adjusts the focus in both sides of the binoculars simultaneously. The least simple is having separate focusing controls for each side of the binoculars. We’d suggest you do not settle for fixed focus. While you probably don’t need to adjust the focus at all when switching between looking at something 75 yards and 150 yards and 300 yards apart, even with variable focus capabilities, if you occasionally use your binoculars to look at closer things, then you will definitely benefit from being able to adjust focus. A fixed focus lens is a compromise that is slightly out of focus everywhere, and increasingly out of focus to the point of uselessness at short ranges. Why would you ever want a slightly out of focus picture? Isn’t the importance of the best possible image worth the slight hassle of turning a knob slightly? Where is the logic of potentially paying $100-$500 more for a high quality pair of binoculars, only to degrade the image by settling for a fixed focus? For hopefully obvious reasons, we definitely do not recommend having separate focus knobs for each side of the binoculars. That is just way to inconvenient and complicated. We might even prefer to have a fixed focus set of binoculars before accepting the double hassle of focusing twice each time we changed the distance between us and whatever we were looking for! Some focusing systems involve turning a wheel/knob, around and around, to adjust focus, and it can take a fair while to do this. Others have a ‘fast focus’ feature – some sort of lever that you only need to move a slight distance to go from closest to most distant focus settings. That might seem like a benefit, but you lose the fine element of focus control with the turning knob, so we suggest you stick to a normal focus mechanism. Next, let’s consider a related feature. Most of us have one eye that is ‘better’ than the other, particularly as we age and our eyes start to deteriorate. If you have corrective lenses, you are already familiar with how their degree of corrective strength is measured in diopters. All good binoculars have a diopter adjustment on one of the two sides. You use this to balance out your two eyes. The way to do it is simple. First, focus the side that does not have the diopter adjustment on something, with your other eye shut. When you have that exactly in focus, close your eye on that side and open the eye on the other side, and turn the diopter adjustment to then get that side exactly in focus, too. Once you’ve made this adjustment you won’t need to do it again, but of course if someone else uses your binoculars, they will want to adjust them for their own vision. So it is helpful to make a note of your diopter setting, so when you get them back, you know where to set it without needing to go through the whole calibration process again. It would also be a kindness, when passing the binoculars to someone else, to zero out the diopter adjustment for them. Due to various interesting and complicated optical things, when light enters (or exits) a glass lens it gets slightly altered, and some light bounces back. The bounced back light reduces the brightness of the final image you see through the binoculars, and the slight alterations create distortion in the image you look at. So, to minimize these things, good quality optics have coatings of special material on them. You definitely want coated optics in your binoculars. Now for the trick. Some binoculars will describe themselves as having ‘coated optics’, some will say ‘fully coated’, some will say ‘multi-coated’ and still others will say ‘fully multi-coated’. You can probably guess that the best is ‘fully multi-coated’. Let’s explain what the others probably mean. A claim for ‘coated optics’ probably means that some lens surfaces are coated with a single layer coating, but others have no coating at all. A claim for ‘fully coated optics’ means that all lens surfaces have a coating, but it is probably only a single layer coating. A claim for ‘multi-coated optics’ means that some lens surfaces have multi-layered coatings, but others probably have nothing. And, of course, the ‘fully multi-coated’ means all lens surfaces have multiple coatings on them. That is generally the best scenario to hope for. One last thing about coatings. Not all coatings are the same, and we have a suspicion that some low-priced low quality binoculars that boast of an optical coating have a fairly useless coating that does almost nothing at all to improve the image quality. You can place your trust in the big brand names, but need to look at generic brands with extra careful scrutiny. It is hard to accurately assess the optical quality of a pair of binoculars just by looking at them, but there are some things you can readily see. Here are several things to look for. The first is to check there is no darkening of the picture around the edges. You want even brightness all the way through. The next is to check that everything is simultaneously in focus, both in the middle and at the edges. Make sure straight lines are straight and aren’t curving (either in or out). Move the lines (both horizontal and vertical) around – curving is most likely to appear around the edges of the image rather than in the center. Next, look at a scene that has fairly bright light. You don’t want any ‘flares’ or ‘streaking’ of the image. Look around the edges of objects with light backgrounds, and make sure the object edges aren’t ringed with color fringes. Now, hold the binoculars several feet away from you and look at the two small circles of image that you can see as if they were on the eyepiece lenses. Rotate the binoculars so these small circles travel out to the edges of the eyepieces, and then have them travel around the edges in a big circle. What you are looking for is to make sure that there aren’t squares inside the circles, greying out the gap between the outside of the square and the outside of the circle. A little bit of this is probably okay, but you’ll see large differences in this effect between different binoculars. Do these checks both when focusing on something up close and something far away. Also, make sure that when you look through them, the images from both sides merge into one single image. If they don’t do this, it is likely that one of the sides of the binoculars is out of alignment with the other side, and that will always (until/unless fixed) interfere with being able to comfortably and effortlessly use them as an extension of your own eyesight. These simple tests will give you a degree of comfort as to the quality of the optics. This is a bit more subjective, but do the binoculars appear to be solidly constructed and well made? We prefer rubberized (sometimes called ‘armored’) type finishes, in the hope that if (when!) we drop them, the rubber surface will absorb some of the shock of having them dropped. The rubber also quietens them – if something knocks against them, less sound will result, and that is sometimes helpful too. One important test is to screw the focus adjustment all the way so the eyepieces move furthest out from the body of the binoculars. Then lightly press on each of the two eyepieces and see if it wobbles. It is important they stay solidly at the distance they are at, or else the varying pressure you’ll place on them during normal use will cause them to get out of focus with each other. Poorer quality binoculars often display some weakness with this, good quality ones do not. A similar consideration indicative of quality (or not) is you don’t want any slack or slop in the focusing mechanism, or in the way you can open up or close down the binoculars to adjust the distance between the eyepieces. Are the two tubes held absolutely solidly in alignment with each other. Even the slightest misalignment will interfere with your brain’s ability to blend the two images together. Make sure that there is no susceptibility to any movement of either tube with respect to the other. In terms of repair, can you readily access the interior of the binoculars and adjust the prisms? If you drop them (we always have the carry strap around our neck so as to minimize the danger of dropping, and you should too) there’s a danger the prisms will be knocked out of alignment and you’ll want to be able to go in and try to realign them. The prisms should not be glued in place, and you should be able to unscrew the parts of the binoculars to get inside. Note that if you open up ‘fog proof’ binoculars, when you reseal them they will probably no longer be fog proof. If this was an essential thing for you, you could at least flush them with wine bottle gas before sealing them up again, and that would displace much of the moisture bearing regular air. This is a deceptive concept. On the one hand, if you will be carrying binoculars with you, you want them as light as possible. On the other hand, well-built and ‘solid’ binoculars will probably also be heavier. That’s not to say that heavier binoculars are automatically better made and stronger than lighter ones. We suggest you consider all other factors first, and only then, think about weight and possibly, if you are sure it is not compromising the quality of the binoculars, give preference to lighter weight. Some binoculars super-impose a compass display so you know what compass bearing you are looking at. That’s a moderately useful feature in theory, but the compasses are often much less than perfectly accurate, which greatly detracts from your ability to pass sighting data on to other people. In addition, if you do not have the binoculars flat and level, the compass may not spin so freely. Yes, you’ve got a $500 pair of binoculars with a 50c ‘toy’ compass inside – lucky you! Some binoculars have ‘range finding’ marks on them a bit like rifle sights. If you know the size of something you are looking at, the range finding marks help you to estimate its distance from you. That may be a useful feature, particularly when away from home, because around your retreat, you’ll have of course already plotted out distances between all landmarks and relevant features (won’t you!). Note that both compasses and range finding marks might be hard to see in the dark, and/or might require batteries for illumination. We don’t consider either as a ‘must have’ feature. Some binoculars have laser range-finders built into them. That’s a lovely feature to have, but don’t get carried away and compromise on other features just to get the laser range-finder, because it is easy enough to buy a separate standalone laser rangefinder . Indeed, we’d generally recommend you to get a separate unit, because it is probably much cheaper to do so – they cost about $100-$150 and are accurate to within a yard at ranges of potentially up to 600 yards, depending on what you’re trying to bounce the laser beam off (the bigger and more reflective the surface you are shining the laser at, the better). Long range precision shooters love these devices. Make sure the binoculars have lens caps for all four lenses, and also some type of carry case. You want a neck strap for the binoculars and a second neck strap for the carry case. We suggest you buy a good pair of 7 x 50 binoculars generally in line with the comments above. Expect to pay over $100 but be reluctant to pay over $500 (based on August 2014 pricing on Amazon ). Although there definitely are some lovely binoculars available for much more money, you’ll get very good binoculars within this price range that you’ll be very happy with. The Surefire M1 is an inexpensive high quality IR Illuminator that works well with most night vision devices. In theory, a good night vision device will be operated in passive mode, and is able to brighten up very dimly lit scenes to a point where you can usefully understand what it is showing you. In reality, many times this is not possible, either because there is too little light, or because the light, while present, is ‘wrong’. By that we mean light sources in the background can drown out the details in the shadows of objects in the foreground, just the same way as when you take a regular photo of anything with a bright light in the background – the objects in the foreground are too dark. When you have strong backlighting, you need to counter this with strong front lighting, ie from yourself, so as to get detail back into the shadows. With a camera, you use a flash. 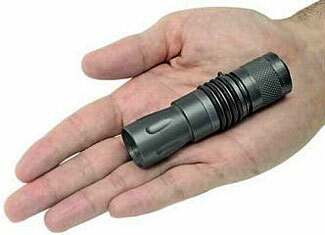 With a night vision device, you use a supplementary illuminator. You need to realize that every shadow potentially contains a threat. Any time you see an area of uniform black (and also any time you see an area of uniform white) that is not telling you there is nothing there. Instead, it should be warning you that your Night Vision Device (NVD) is incapable of displaying whatever it is that might be present in that area of solid black or white (well, more commonly green, but you know what we mean!). You should keep your NVD calibrated – both via settings on the device and by way of your use of supplementary light – so that everything in the area you are surveying shows some sign of greeny/grey rather than solid green/black. Solid green/black obscures whatever it is in those areas and is dangerously deceptive. So it is common – and necessary – for most NVDs to include a light source that you can switch on to actively illuminate what you’re looking at. These light sources are always infra-red rather than normal white light. This is so as to maintain a stealth factor and to keep whatever tactical advantage you might have by means of your NVD. A normal visible light source would work perfectly well, of course, but using a regular flashlight makes your own presence obvious to any animal or person out there, and also allows anyone else out there to benefit from the light that it shines into dark spaces. There’s another more subtle tactical advantage you’ve handed to any adversaries, too. They can see where you are looking, and also, by clear inference, where you are not looking. They know how to sneak past you (or how to sneak up and surprise you) based on clearly seeing what you are looking at. None of these outcomes and tactical shifts are desirable. Perhaps the worst part of this is that if the aggressors also have some way of seeing infra-red – their own NVD, for example, you’re at a double disadvantage. They can surely see your beam of IR light, no matter how poor and primitive their NVD, but you don’t know they can see you. Ugh. Even if your adversaries don’t have any type of NVD, there is still a possible way you might risk disclosing your presence. While the human eye can’t see infra-red light, some IR illuminators will glow, weakly, with a bit of a visible red glow that can be seen by the naked eye. On a dark night, maybe the aggressors have adjusted their eyes to the low light and simply see the dim glow from your illuminator, even without needing to have NVDs of their own. For all these reasons, we recommend you use illuminators very sparingly. However, when you do need to use one, it is usually a case of ‘the brighter the better’ and you may find that the built-in illuminator on your NVD is inadequate. So if you are going to use an illuminator, get a powerful and therefore probably separate illuminator (with a bit of luck, if the other side have low quality NVD gear, your powerful illuminator might even overload and destroy their gear!). There are three things to consider when choosing a supplementary illuminator. The first is its brightness. As we said, generally, the brighter the better, but if you expect to be using this only at very short-range (ie within your retreat), too much brightness might overwhelm your NVD and cause everything to be white and washed out. You’ll need to test any illuminators you get, and hopefully you’ll source them through a supplier with a generous return policy! The second is how broad the beam angle is. For short-range work, you want a broad beam at least as broad as the field of vision through the NVD. This is so everything you are looking at is illuminated – you don’t want to leave any dark spots where surprises may be lurking. If your requirement is for long-range illumination, you will want a narrower beam so that it carries further before getting too dispersed (and of course, the brighter the beam, the longer the range, too). The third is the evenness of its beam. This is very important – you don’t want a ‘doughnut of death’ where there is a bright ring of light but a dark patch in the middle. Make sure the beam evenly illuminates everything within its coverage – this is even more important than with flashlights, because NVDs handle variations of light intensity and contrast within their image less well than our naked eyes do, and because of the ‘unreal’ or indirect nature of the image shown on an NVD display, you’re never quite sure if a dark patch is due to nothing being there or just a weakness in the NVD and the illumination that is driving it. One other factor that few people consider, but which we think very important, is how the beam is switched on and off. Depending on what you are using the illuminator with and what else you expect to be doing with your hands, you might find the best type of switch is a ‘momentary on’ switch. That is, you press the switch and for as long as you are holding the switch down, the light is on, and as soon as you take your finger off the switch, the light goes off again. This is much better than a switch that you press and release to turn on, then need to press and release a second time to turn off. If things get ‘busy’ you might not be able to conveniently turn the light off again, and risk leaving the light on and drawing attention to yourself. Of course this consideration is most relevant when using regular white light that everyone can see, but you should treat an ‘invisible’ IR beam as just as visible and dangerous to you as a regular flashlight, because for all you know your adversary also has NVD and your IR beam will appear like a huge searchlight shining into the sky when he looks in your general direction. One more switching consideration. It is really nice if there is a way to ensure the device doesn’t switch on accidentally when bumped – particularly if it is a ‘permanent’ on rather than a temporary on. You might inadvertently have your IR beam on and not even realize it yourself! A good general purpose illuminator is the Surefire M1 (about $120 on Amazon). The former pre-eminence of Surefire for all types of tactical lighting products is these days under challenge by many new manufacturers, sometimes apparently offering better seeming products and at better seeming prices, but when you want to make a ‘safe’ choice and know, for sure, you are getting something built to the highest standards of quality and reliability, we feel that Surefire remains the best choice. If you are wanting an illuminator for long-range surveillance, then you’ll find the M1 inadequate. But a word of warning about long-range surveillance. Don’t try to use your NVD further than it is capable of being used – there comes a point where the limits of resolution and the fuzziness of the image being displayed to you make it less useful, and no amount of extra illumination will make that any better. For longer range purposes, we like the Luna Optics range of illuminators. They also offer more expensive laser illuminators , but we’re unconvinced they offer better performance than the IR LED units. We need to state something that we hope might already be obvious. You already know that one danger of using an illuminator is that your adversary might detect the beam from the illuminator, creating a flipped tactical situation where they for sure know where you are (and also know what you’re looking at and so can avoid being there) while you have no idea at all if there are any adversaries out there at all. The additional issue is in two parts. Firstly, please understand that no matter how powerful an illuminator, it won’t show you something that you aren’t looking at and illuminating. Secondly, the extra vision capabilities that you believe you are enjoying – and your inevitable feeling of having ‘tactical battlefield superiority’ is largely an illusion. Do not abandon your defensive posture. Using lights with NVDs is a bit like submarines stalking each other in the ocean. All submarines have both active and passive sonar. And, similarly, all submarines almost exclusively use only passive sonar. It is only on rare occasion that a submarine will send out an active ‘ping’. Although doing so might give that submarine useful battlefield data for a relatively short distance around itself, the sound of the ping will also reveal its formerly hidden location to all other submarines for a much greater distance around. It is the same with illuminators, or lights in general. Sometimes you have no choice but to use them, but when you do, the tactical situation changes massively and potentially unpredictably. One scenario where illuminators might sometimes have a value would be if your retreat comes under attack at night and your attackers are hard to see in the dark. In such a case, turning on external floodlight type illuminators, shining out from your retreat, would help you to see them more clearly. But is this an overly complicated solution to a simple problem? Why not use regular lighting, which means everyone in your retreat can see the aggressors without needing NVDs, and the aggressors are blinded by the bright lights which makes it difficult to see where you are, semi-safely located behind (and to one side, please!) of the lights. Sometimes we become too reliant on technology, and certainly as preppers, we know the inherent dangers of this. If you’re trying to get good vision of distant objects, don’t overlook the value of regular binoculars which can work well, even at night. If you want to use binoculars at night, there’s one important thing to do – make sure that when you divide the diameter of the objective lens (the big one that faces towards what you are looking like) by the magnification factor, the result is at least seven. This indicates the size of the image that you see through the eyepieces, and you want it to be sufficiently large to fill your eye pupils, so that at night, all your light collecting ability is being used. The lower the number (for example, a pair of 8×40 glasses with the number 5 being derived) the less light collecting and the poorer they will work for you at night. The classic binocular rating is 7 x 50. This is close to the best all-round day/night portable binocular. If your budget extends to night vision devices, you will need to also get supplementary illuminating devices so you can sometimes and selectively optimize the ability of your NVDs to reveal details of what is otherwise obscured in the dark shadows around you. But using a supplementary illuminator can be a double-edged sword. If an adversary also has NVD capabilities, your illuminator has clearly revealed your position and also shows where you’re watching, potentially giving a massive tactical advantage to your adversary. For this reason, use such devices selectively and carefully. How did our country change from Andy Griffith type consensus policing to military style police assault? We hear this lie way too often, and sadly we see some people base their future plans on the lie. Don’t fall for this trap. So, what is the lie? Go to any gun rights forum and you’ll see it in its purest form. In the context of gun rights, its purest form is someone asserting, not as a joke but as an apparent truth ‘they’ll take my gun from me only when they pry it from my dead fingers’. But the lie exists, sometimes in obvious form and sometimes in more subtle form, in many different contexts, not just gun rights. The prepping version of this lie is ‘I’ll never let them take my preps from me’. In its broadest form, it is any person claiming that they will take extreme action to oppose anything they disagree with. We have two words to offer to the bold brave blowhards who claim they’d die rather than relinquish their firearms, who claim they’ll shoot it out rather than surrender. New Orleans. There’s a huge number of ‘good old boys’ living in the New Orleans area, and exactly how many of them refused to allow the police to seize their weapons after Hurricane Katrina? Exactly zero. None. Zip. De nada. They meekly surrendered their guns like the sheep they truly are. Or, to put it in another context, how about all the gun owners in states that place restrictions on gun ownership already. How many of those people have made brave (perhaps ‘foolhardy’ is a better term) fights to the death over their claimed rights? None. If they are told they are not allowed ‘assault rifles’ they meekly comply. If they are told they can’t have magazines with more than ten rounds, they meekly comply. If they’re told they need to get a firearm owner’s certificate and permission to buy a firearm – yes, again they meekly comply. But then, after having meekly complied with all these restrictions, they tell us that if someone tries to take their firearms from them, they’ll fight to the finish! Apparently they don’t realize their firearms rights have already been largely taken from them. And as for the corollary (that decent right-thinking police would refuse to comply with illegal/unconstitutional orders), again, two words. New Orleans. How many police and county sheriff deputies refused to seize people’s weapons, often at gunpoint, even from friends and neighbors? Again, zero. For the preppers making similar statements, how many preppers openly defy laws restricting how much fuel they can store in a residence? None that we know of. Sure, some preppers might discreetly choose to ignore some restrictions, but how many do so openly and are keen to fight to the death over that issue? None (and just as well – we have a bad enough a public image already!). Furthermore, and bearing in mind the billions of bullets that the Department of Homeland Security is amassing, if/when the authorities come to seize your preps or guns or whatever, who is to say they’ll need to rely on the help of the local police? How big is the DHS? The short answer is they are the third largest Cabinet department (after DoD and Veterans Affairs). They employ about a quarter million people and have a budget of more than $100 billion (the DHS budget requires more than $300 from every man woman and child in the country, every year), but the question is the wrong question. The better question is ‘how big is the entire government security/enforcement apparatus? The DHS is only the most visible part of the growing government security and control organization. This Sept 2010 article by the Washington Post (surprisingly critical for a left of center publication) says that some 1,271 government organizations and 1,931 private companies work on programs related to counterterrorism, homeland security and intelligence, in about 10,000 locations around the US. The WaPo article can’t even guess at the total headcount of all these organizations and private contractor companies. To put those 10,000 locations into context, there are 50 states and 3,143 counties in the US. That means that each state averages 200 different locations with shadowy security type structures in place and people employed by them; or, if you prefer, an average of 3 locations in every county. And that was back in 2010. You have to believe the numbers have grown still further in the almost three years since then. Here’s one more version of the enormous lie. This one diffuses out the claim a bit – ‘The people in our area would never allow (whatever) to happen; they’re too conservative’. That is a harder claim to ridicule, of course, which is why it is often made. But if you hear that claim being made, go have a look at the election results from the area that is supposedly ‘too conservative’. Okay, so maybe they elected a Republican congressman/senator/whatever, but by what size of majority? If you look at conservative states that are touted as ‘the American Redoubt’, did you know that in 2008, Montana almost gave its electoral college votes to Obama rather than McCain? McCain had only 2.5% more votes supporting him than Obama. How conservative is that? If we drill down to county level results, some of the ‘best’ areas of Idaho and Montana for preppers have surprisingly large Democratic bases – as much as one in three people votes Democrat, even when faced with such stark choices as between (in 2012) Obama and Romney. Sure, some counties are more overwhelmingly Republican, but some counties are strongly Democrat too. So if you have one-third voting Democrat, and at least half of the other two-thirds being only weakly Republican, our question becomes ‘just how conservative is your area, really?’. For example, the small city of Troy in MT, which you’d hope would be ultra-conservative, has a city ordinance banning firearms from city parks. This is in a state touted as being one of the most ardent supporters of the Second Amendment (where in the Second Amendment does it say ‘except in city parks’?). Indeed, not only does this show a surprisingly anti-gun sentiment in Troy, but it also points out the regrettable lack in Montana of a comprehensive state level pre-emption statute forbidding all county, city and town gun laws in addition to the state laws. Okay, so we’ve roamed around the topic fairly broadly here. What are we actually trying to say? Simply this : If you take comfort in the claims by other people that if/when something unconscionable occurs, they will resist such things all the way to the use of deadly force, and even at risk of personal injury or death, you are mistaken. And if you take comfort in the claims by other people that bad things could never happen because either it is unconstitutional or because good honest Americans would refuse to enforce the provision, you are again mistaken. If you think that bad things could never be imposed on the American people because we, the people, would oppose such things, and because the Americans directed to impose such bad things on us would refuse to do so, you are very very mistaken. The ugly reality is that we are already increasingly constrained by laws that many people would consider unconstitutional, particularly as regards the first, second, and fourth amendments. The ugly reality is that whenever people have been confronted by armed police demanding they acquiesce and allow their property to be searched without a warrant or due cause (ie after the Boston bombing) or demanding they surrender their firearms (ie after Hurricane Katrina in New Orleans) everyone has uniformly acquiesced. We are already much closer to a police state than we realize, and our constitutional rights have been massively constrained. 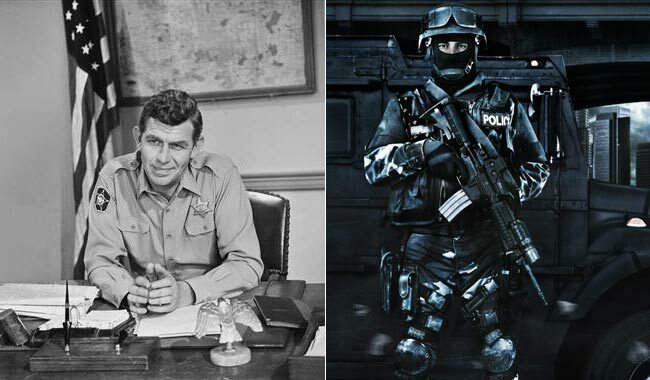 How did weaponless friendly Andy Griffith morph into police in tactical gear with body armor and fully auto weapons, and with head masks obscuring their identity and making them all the more impersonal and unaccountable? How did a world where firearms training was often offered at schools morph into a world where a child drawing a picture of a gun gets suspended and ‘counselled’ (some might say ‘brainwashed’)? You need to realize that bad things could and might happen, and if they do, there is unlikely to be any popular uprising against such bad things, and that the authorities will be able to enforce such things with overwhelming force. Our founding fathers would not recognize the America of today. Whether intentional or accidental, a vehicle can very effectively smash through most unprotected building exteriors. You probably already know that your retreat needs to be reasonably protected against high velocity ballistic attack, which is a fancy way of saying it should be more or less ‘bullet-proof’. But have you thought about low velocity attacks? What do we mean by low velocity attacks? We mean instead of having small rapidly moving things (ie bullets) impacting on the side of your retreat and possibly penetrating through the walls, having much larger but slower moving things impacting on the side of your retreat and again possibly penetrating the walls. The first example of such an object would be a traditional battering ram. We’re going to hope that there’s not much chance of an enemy being able to deploy a battering ram against your retreat doors or windows, because that would presumably expose the people with the battering ram to sustained fire from you and your fellow defenders, to the point that by the time they’d positioned their ram and started to use it, they’d have experienced unacceptable casualties, causing them to break off the attack. But there’s another type of low velocity ballistic weapon which you need to consider. What say the bad guys simply drive a car or truck at full speed up to your retreat and crash it in through the walls? To put things in perspective, a typical pistol bullet has in the order of 300 – 900 ft lbs of kinetic energy. A .308 rifle round is in the order of 2000 – 2500 ft lbs. A 5,000 lb car or truck, traveling at 30 mph, has 150,000 ft lbs of kinetic energy. Get its speed up to 42 mph and it has 300,000 ft lbs of energy. If you can get it to 60 mph, it will have 600,000 ft lbs of kinetic energy. 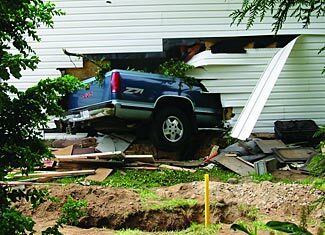 A passenger car, even at fairly low speeds, can crash right through the exterior of a typical stick built home, and end up in the living room (we know this from experience). Add extra weight, reinforce the front with a ram to focus all that energy in one concentrated area, and get the speed up a bit, and any attacker has a formidable weapon. It isn’t even a very high-tech weapon. Any old vehicle, as long as it can be driven, will work perfectly well. One more point. With safety belts (and possibly air bags), even at quite high speeds, the person driving the vehicle into your house is unlikely to be harmed. The reason for this is that the impact event is spread out over time and distance, so instead of a deadly sudden impact lasting only a few hundreds of a second, it is a survivable impact that extends over a second or longer. There’s another issue, too. At even a fairly slow 30 mph, the vehicle is covering 45 feet every second. If you have, say, a 250 ft ‘clear zone’ around your retreat, that means it takes the vehicle just over five seconds from when it first appears to when it is crashing through your wall. That’s not much time to respond to the threat – even if you were on active sentry duty, at least a second to recognize the threat and start a response, another second or more to get your rifle shouldered, sighted, and safety off, and that leaves less than three seconds to try to do something. With the vehicle being a moving target and its angle to you probably rapidly changing (meaning you need to appreciably lead the target with your sighting – how much practice do you have at that? ), your chance of getting any effective fire on it is minimal. Even if you could get some rounds landing on the vehicle, and while that might injure or kill the people inside, you’re almost certainly not going to stop the vehicle continuing on and into your wall. Sacrificing a vehicle to break into your retreat might seem like an extreme move that not many attacking groups would willingly do, but if that’s what you think, maybe you should think again. Our prediction is that in a Level 2/3 situation, vehicles will be a dime a dozen. What will be in precious short supply is fuel for the vehicles, but how much fuel does it take to start a vehicle, gun the engine, and drive it at full power a couple of hundred yards? A pint or two of petrol should do the trick. An adversary could have a team of horses tow the vehicle to close to your retreat and would only need to use precious petrol for the last short powered dash of the vehicle into your outer wall. Such a method of attack – unless you had prepared for it – would be very hard to resist. It behooves you to consider this risk and devise appropriate defensive measures. The obvious solution might be to strengthen your walls still further, but that’s not necessarily the best, and certainly is far from the only possible response. Generally, we’d recommend the better thing to do is to prevent potentially threatening vehicles from being able to approach your retreat at any speed other than a crawl. Keep the battle at a safe distance from your retreat whenever possible. There are two ways to do this. The first involves ‘taking things away from the ground’ and the second involves ‘adding things to the ground’. In other words, digging holes and ditches, or adding obstructions and obstacles. An obstacle doesn’t need to be large to be effective. It can be either permanently mounted (ie dug deep into the ground to hold it in place) or can be relatively mobile. There are many different types of obstacles, but for simplicity, we’ll consider four primary types. In sequence from easy and simple to largest and most complex, the first type is very simple – known as caltrops, these are nothing more than metal spikes/stars that you can sprinkle over the ground. At least one of the spikes always sticks up and so will puncture a vehicle’s tire(s). The best caltrops are made out of hollow tubing, so as to increase the certainty and speed of the tire puncturing. The nice thing about caltrops is they are low tech, simple to make, and quick and easy to deploy and similarly not difficult to remove again. You might be thinking ‘if I can easily remove them, so too could an attacker’, and that is half-true. But while the attacker is out there, sweeping aside your caltrops, he is very exposed and vulnerable to your defensive fire, and he has lost the ability to surprise you with a vehicle coming from nowhere and cannoning into your retreat unexpectedly. You could even have a caltrop deploying device – a slingshot or something – that would enable you to throw more caltrops onto any cleared pathway. You’d be tossing them out from behind cover, while the bad guys would have to be exposed in the open to clear them. A second type of low tech very simple obstacle is almost laughable in its simplicity, but people who have seen this in action assure us of its effectiveness. Simply strew old car/truck tires where you wish to impede on-coming traffic. We are told that this will massively slow down an oncoming vehicle, as it suddenly finds itself having to go up and down over tires that are probably each 6″ – 12″ high. Like the caltrops, the tires can be spread out and cleared on an ‘as needed’ basis, and while an opposing force could also clear the tires, that would again involve exposing themselves to your defensive fire. A really determined enemy could devise a ‘snow plow’ or ‘cow catcher’ front to put on their vehicle that would deflect tires and caltrops away, although it would probably have to do so at lower speed. The bottom line for both these approaches (and indeed for all of them) is that a truly comprehensive defense involves using multiple layers and strategies, and you have to realistically decide where to draw the line and how much is enough. The third type is what are sometimes called Czech hedgehogs. They are structures that might be freestanding, or possibly weakly anchored. They might be individual units or possibly may be linked together, and might be made out of metal or concrete. They work best when they are only slightly taller than the clearance underneath the class of vehicles they are designed to stop – that is a reasonably known quantity when defending against tanks, but in your case, you might be confronting anything from a low slung sports car to a ridiculously raised 4×4. So these are not so good as a general purpose ‘one size fits all’ device. The fourth type are large heavy concrete blocks – possibly in pyramid shape, possibly just pillars or some other shape. These objects are more commonly securely mounted in the ground. They have been called dragon’s teeth (and many other names too). Unless they are ridiculously solid, they are vulnerable to being knocked over by a sufficiently strong oncoming vehicle. But in the course of being knocked over, they will absorb a great deal of the vehicle’s energy. They are particularly good, in this ‘sacrificial mode’ when reasonably close to your retreat exterior, so in the event of them failing, the vehicle won’t have enough distance to build up speed again. Noting that attacking vehicles might have been raised up on trick suspension, we’d suggest you need to make any sort of obstruction fairly tall, and we don’t really much like that concept too much because you may then be providing cover for enemy forces to shelter behind when attacking you. Obviously, obstacles can also be large and prominent. You could have a three-foot high and three-foot thick wall (perhaps a type of Hesco bastion, for example). But then you run the risk of providing a defensive cover for your attackers to shelter behind, hence our focus on smaller sized obstacles that don’t have this type of downside associated with them. There’s another type of simple but effective device for slowing down vehicles, but it is not without its limitations in our sort of environment : A gravel pit, such as you sometimes see going down long steep hills for runaway trucks. If you’ve ever seen one of those, you may have noticed how short it seems – those gravel pits do a great job of slowing down and stopping a speeding truck on a steep slope and would do the same for any vehicles approach you at speed too. 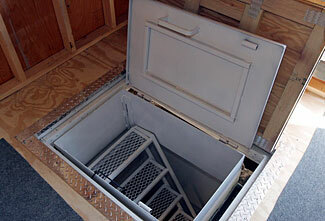 Arrester beds typically have a depth of between two and three feet of small-sized gravel in them. Some locations use sand, which provides a much stronger decelerating force, but in cold winters, the sand will freeze into solid blocks and cease to function as a dragging medium, instead it becomes a smooth surface for the vehicle to drive over, unimpeded. A loose gravel pit will probably still work as intended in freezing weather. The shape of the gravel is important – ideally it should be fairly well-rounded, enabling each piece to move and slide over each other piece, rather than causing pieces to interlock together and present a firmer more solid platform for the vehicle to drive on the top of. A truck at 45 mph typically takes 200 – 250 ft to stop in an arrester bed. That becomes a massive waste of space if being used to defend a retreat on all sides, unfortunately, making arrester beds less practical for retreat defense. In addition to gravel and sand arrester beds, there is a special type of collapsible concrete material used at some airports as a run-off zone at the end of runways. This material stops planes safely and quickly and in less distance. This ‘engineered material’ has also been used to protect the approaches to secure locations, being a discreet way of providing protection against vehicular attacks. It is more expensive, but takes up less space. Unlike gravel, which is a relatively low tech product that can be probably fairly easily replaced or just raked back into place, once the collapsing concrete blocks have stopped a vehicle they need to be replaced. This would be difficult in a Level 2/3 situation, and you’re still looking at a requirement for at least 100 ft of arresting zone. A defensive ditch can be a great vehicle stopper. It can also slow the advance of regular infantry forces, although note that any such ditch needs to be designed so it doesn’t inadvertently provide a secure position for enemy troops to regroup in and then press their attack against you. In other words, the closer the ditch is to you, the more readily you’ll be able to shoot down into the ditch, and the less cover it will provide an attacking force. If you have abundant supplies of water, adding water to a ditch makes it into a moat, which can slow down the progress of enemy forces and vehicles even more effectively. A moat can be expensive to create, especially if you line it with concrete, although it would be possible to line a moat with puddled mud as an alternative. Depending on where your retreat was located and the wind and weather conditions, you could expect appreciable evaporation in summer, and if it froze over the winter it would not be very effective while frozen solid. A possibly easy solution to that would be to partially or completely drain the moat in fall and refill it in spring, assuming water is plentiful. Moats and trenches can be bridged over, and if they are not very wide, maybe by nothing more sophisticated than 2″x12″ planking, although such an arrangement would not allow for a vehicle to proceed over at high-speed. Traditionally, castle moats were at least 12 ft wide, and ranged in-depth from as little as 3 ft to as much as 30 ft. Ideally they would be too deep to allow an attacker to wade across. A 30 ft depth is of course not so essential, but one benefit of a deeper moat was (and still could be) that it protected the structure inside the moat from tunnelers. Unlike medieval sieges, we feel it unlikely that any attacking force against your retreat would go to that degree of effort, whereas the depth of moat might interfere with your own escape tunnels out of your retreat. Clearly the width is an important parameter – the wider, the better, at least up to a certain point. But it is also necessary to consider cost. For example, if we say your retreat exterior measures 40′ x 100′, and if we say there is a three-foot space between the building’s exterior walls and the start of the moat, and let’s make the moat 15 ft wide and 8 ft deep, that’s a lot of excavation (44,000 cu ft of dirt). You could use some of that to build up the raised berm on which your retreat stands, and you’re sure to find a landscaping or strategic use for the rest, but you’ll still have to pay a considerable sum for the earthworks. If you decide to line your moat with concrete, and if you have a six-inch thick floor and walls (some sources suggest thicker walls), then using the same moat dimensions as in the previous paragraph, you need 5624 cu ft of concrete, or 210 yards. At a total cost for the concrete and pouring of perhaps $200/yard, that’s close on $45,000 for the concrete alone. As for the water required, let’s say you decide to fill the 8′ deep moat with 6′ of water. That would require 245,000 gallons of water. One more interesting factor about a moat. On a warm summer’s day with a gentle breeze, you would lose at least 1,000 gallons of water a day to evaporation. Note that the evaporative loss rate is unaffected by the depth of water – it is proportional to the surface area of water, not its depth (and also to the temperature, humidity, and wind speed), so simply reducing the depth of moat water would do nothing to reduce the rate of evaporation. Of course, a moat is effective whether wet or dry. If dry, it is a ditch and still prevents vehicles transiting over it, and slows people down – they have to climb down 8 ft (in the example we have been using) and then climb up 8 ft at the other side, and then have only a very slim 3ft ‘work area’ pressed up hard against your retreat’s exterior walls. The more water in the moat, the slower their progress across it will be, and the more difficult it will be to take equipment with them. If you find yourself choosing between a deeper moat and a wider moat, then assuming you have a minimum width of 12′ or slightly greater, you would be best advised to make your moat deeper rather than wider. There is little or no added value in increasing the width – the difficulty of a moat is mainly in the ‘transitions’ from level ground to whatever depth/differential the moat is, and then from whatever level the moat is to the ground on the other side. Ideally, we’d recommend the water depth be 6′ or slightly greater so that people can’t conveniently walk across, and then any extra depth should be used to create a vertical air space/wall between the water level and the ground level. Getting in and out of a moat is even more difficult if you have to ascend or descend more than a convenient number of feet, and with water rather than solid ground at the lower level. 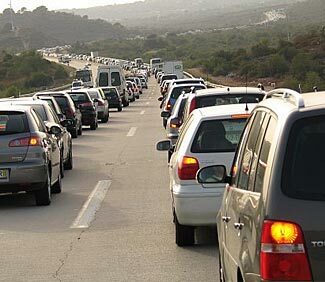 You need your own vehicles to be able to travel through your obstructions, and you’ll also have legitimate friendly traffic coming and going too. If you have a ditch or moat, obviously the solution for that is to provide a drawbridge – either a device like in old-fashioned castles that raises up and lowers down, or alternatively one which extends out from your retreat to the other side, or one which rotates/swivels. Of course, whichever design you use needs to be very secure so that an opposing force can’t take over its mechanism and lower/extend/rotate it to span the moat against your will. If you are relying on a series of above ground obstacles, you need a lane through them that vehicles can travel, and by including tight turns, you ensure that the vehicles have to move slowly. The best type of tight turn is to require a three-point (or sometimes called ‘Y’) turn. Because it requires the vehicle to actually stop, reverse, then proceed on forwards again, this is a very effective delay. Of course, having had to very slowly work through the obstacles would cause the enemy to be in the open and exposed to your defensive fire for an extended period, plus means that when they finally do arrive close to your retreat wall, they are moving slowly rather than quickly. Note that when you are planning for how you will allow legitimate traffic to come and go, you need to consider the dimensions and turning abilities of the largest probable type of vehicle that may legitimately visit. This could be as large as a semi truck/trailer unit with a 56′ long container behind the tractor unit; alternatively, you might decide to have a staging point somewhere remote from your retreat where larger vehicles can be unloaded to smaller vehicles. That is a much less efficient arrangement, so if it is possible to allow for at least moderately large semi trucks to get through your ‘maze’ that would be the best option. Naturally you want to stop vehicle attacks some safe distance from your retreat. Even a slow speed vehicle, when approaching your retreat, can provide cover for enemy attackers sheltering behind or alongside the vehicle as it slowly moves forward, so some type of obstacle arrangement is essential. Unavoidably, the further away from your retreat you place such defenses, the more extensive they will have to be. If you have a retreat with perhaps 40′ x 100′ exterior walls, the walls themselves have a length of 280 ft. If your vehicle barriers are a mere 100 ft away from your retreat (a distance that a sprinting attacker could cover in four seconds or less) then they will be a massive 1080 linear feet in size. So possibly you’ll have a partial line of obstructions at a distance to slow down incoming vehicles, then a more severe obstacle design closer in to stop them. This is the concept of layered defenses – it also helps you to understand the intentions of people approaching your retreat, requiring them to show aggression earlier on. In addition, if the budget allows for it, maybe it makes sense to have a last line of defense that is actually immediately adjacent to – or even part of – your retreat wall. One form of this would be an immediately adjoining moat. Another form would be to build your entire retreat above grade on a berm. 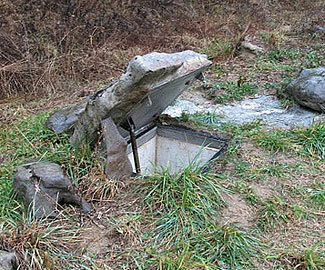 Maybe the first three feet or so of the retreat is nothing other than a solid earth foundation. In addition to its three-foot (or more) height, f you had this solid earth foundation extend out even only another foot or so (due to it being liable to be compressed if hit by a vehicle) that would be a very strong stand-off layer. Having your retreat an extra three feet higher is a good thing for all reasons, giving you a better commanding view of your surroundings. And presumably at least part of that extra three feet of height would be used to get you a head start on excavating basements, too – your below grade basements would in effect have their first three feet above ground level, but still be treated as basement. In the event that you were blessed with a water table that was very close to the surface, raising up the ground level of your retreat structure is obviously very beneficial. Whether you raise up your retreat or not, you definitely should make sure there’s not a downhill slope running towards your retreat. That just makes it so much easier for an incoming vehicle to gather more speed and more energy. It isn’t only bad feng shui to have your house lower than the surrounding area, it is bad strategy too. There will be three major categories of physical threat against your retreat. Bullets, heavy weights and vehicles, and people. A good series of obstructive defenses will help keep vehicles away from your retreat walls, and will slow down the speed at which people can reach your walls too. It is easy to underestimate how far away a person can be and still be an immediate danger. A person 100 yards away can cover that distance, if there are no obstructions, in about 10 seconds, whereas if you’re just going about your ordinary lives in your retreat, there’s no way you can mount an effective defense with that little warning. Rather than creating impractically huge clear zones around your retreat, you need to slow down the speed at which people as well as vehicles can get to your retreat, to buy you time to prepare an effective defense. Above ground obstructions have some value in slowing down vehicles, but are less effective against individuals on foot. Fencing works well against people (but probably not vehicles). Ditches and moats will stop most vehicles and slow down people. Beware nearby major roads that will funnel refugees fleeing from the cities and into your region. You have a difficult balancing act to carry out when choosing your retreat location. You don’t want to be too close to major population centers, because they largely comprise an overwhelming number of people who can not support themselves in a crisis and who will be forced to do whatever it takes to survive – even if that extends to harming other people and taking their food and shelter from them. On the other hand, you don’t want to be too far away from other ‘good’ people and to participate in whatever level of mutually beneficial support you and they can exchange in a Level 2/3 situation. We wrote in an earlier article about the general desirability of siting your retreat in a low population density area. We’ve also written about the benefit – indeed, the need – to be close to a ‘good’ small town. In general, there’s a fairly direct relationship between a population center’s size and the safe distance you wish to be from it. The bigger the population center is, the further away you wish to be. But if a population grouping is small, safe and sane, then you’d prefer to be reasonably close to it. That much is moderately intuitive. So let’s move on to some additional considerations. The distance you want to keep between yourself and appreciably sized population concentrations needs to be measured not just in ‘as the crow flies’ miles, but also by traveling time and difficulty. Clearly, a mile on straight and level freeway is pretty much the same whether it is traveling toward you from the north or south or any other direction. But a level straight freeway mile is much less of an effective separation than a mile through dense forest with no roads, or a mile that is intersected by a wide deep fast flowing river with no crossing points, or a mile that involves traveling up one side of a mountain and down the other. In some cases, an overland mile might count for the same as ten freeway miles. In other cases, an overland mile is a complete barrier, and people will have to choose other routes to get from where they are to where you are. Which points to an interesting and significant consideration. When a person is mapping out their travels (assuming they actually have a map and a purpose for traveling) they will be seeking out easy routes in preference to hard routes. They’d rather take the mountain pass route than the mountain summit route, for example. If you are located close to the mountain summit route, there will be fewer people spilling off the road and into your retreat than if you’re on the mountain pass route. Even if traveling itinerantly with no fixed abode, most people will be thinking along the lines of ‘Where is a place I can conveniently get to in a day or two of travel where I’m likely to find some opportunities for food and shelter?’. Their preference will probably be to go towards small townships and other places where small settlements can be easily reached, rather than to go speculatively heading off the major roads on the map and into regions with no evidence of civilization or other supportive resources on the map they’re looking at, and for sure, they’ll seek to avoid difficult to travel routes. People might decide to get somewhat clever and to travel on secondary roads and head for secondary population clusters, particularly as traveling on main routes becomes less feasible and more dangerous, but there comes a point where they’ll decide ‘enough already’ and go in a different direction, simply because they hope there might be better opportunities in another direction. So, when considering how much distance you need to put between yourselves and population centers, you should allow for the effective difficulty of making the journey as well as the straight line distance involved. There are still more considerations when choosing your retreat location with respect to population clusters. Maybe there’s no major population center within whatever you’ve assessed as your necessary separation distance. Great. But there’s another issue to consider as well. Are you close to any major travel routes that will see distressed people and marauders passing along? For example, look at this map of much of Idaho and Montana. What do you see? Not a lot of major cities, which is a good thing. But the most prominent thing you do see is not necessarily a good thing. We are referring to the interstate highway shields and the yellow lines denoting their routes. Now, ask yourself the question – ‘If I were escaping Seattle or Portland, and wanted to get into the redoubt area, what route would I take?’. Zoom the map out a bit to help you answer the question. The answer is probably I-90 from Seattle (and being reinforced by Spokane evacuees) which goes more or less directly into and through the northern and central redoubt, or I-90 then down to I-84 for the southern redoubt. For Portland refugees, they’d simply take I-84 from Portland and then either up to I-90 or on over to I-15 and continuing whichever way from there. If you chose to travel all the way from San Francisco or Los Angeles to the redoubt, how would you do that? From San Francisco (and Sacramento) you’d probably head northeast on I-80 until at some point heading north to join up with I-84 and the crowds moving inland from Portland and Seattle. From Los Angeles or San Diego or Las Vegas, you’d probably travel along I-15 until it breaks into Idaho (some people might choose to stay in UT) and then fan out east or west on I-84. And let’s not forget also that Boise will have its own exodus. Maybe even some people from Salt Lake City will go north and into the redoubt region too. When people start evacuating the cities, there’s likely to be a lot of traffic on these portions of the interstates (well, always assuming people get that far). Our point is simply this. You might decide that a location ‘in the middle of nowhere’ meets your distance requirements, but don’t overlook the presence of any nearby arterial traffic route and the implications this presents. Although people don’t ‘live’ on the freeways (at least not in normal times) it is very likely that freeways and other major highways will become the primary routes people use to flow out of the cities and to where they hope to find either safer places to live or tempting targets to live off. Because of the nature of such people – in large part they have been reduced to becoming itinerant scavengers – they pose a greater threat than the residents of small-sized nearby towns who are possibly attempting to struggle and survive in place through their positive efforts at becoming self-sustaining. Furthermore, as people travel along these routes, they’re going to be needing food and shelter on a regular basis – especially once their cars run out of gas and they transition to traveling on foot. It seems a very likely scenario that there’ll be a ‘path of destruction’ to either side of freeways marked by half a day to a day’s travel time. People will travel for a way on the major route/freeway, and then will go off to one side or the other, looking for food and shelter for a while, before possibly then returning back to the freeway and continuing their journey. Of course, some people will find somewhere they like and just stop and settle there. As long as the place they stop and settle in is not your place, that’s probably a good thing, and the reason why distance buffers you from the full force of people evacuating the cities. When people leave the cities, the density of travelers will reduce with distance. People will semi-randomly leave the main throughways and stop in places, and from time to time turn off the main route and go down minor routes to secondary destinations. In addition – to be brutally blunt – some people will die. There will clearly be a major reduction in traffic once you get the far side of a typical tank of gas driving range from most cities – indeed, if we say that people average 2/3 of a tank of gas in their car at any given time rather than a full tank, some people will start having fuel problems before that. As people’s cars die, they’ll then of course be forced to abandon them and many of such people will immediately look for refuge in the immediate area of where their car ran out of gas. So you definitely want to be at least a day’s travel by foot from the first 350 miles or so of freeway from each major metropolitan center, and hopefully have some sort of ‘barrier’ between you and the major routes, and no ‘magnets’ on beyond your location (see below). In our example, and ignoring all other location issues, we’d definitely say you do not want to be on I-84 anywhere from where it enters Idaho from Oregon and on through the semi-circle as it becomes I-86 and then I-15 up to I-90, and we’d probably give I-90 a wide berth too. I-15 heading straight-shot north from I-90 up to the Canadian border also looks like a major distributor route for people to take who have reached the redoubt and are now looking to get into the more remote parts. We mentioned the desirability of having a barrier between you and a major thoroughfare, and the need to avoid having a magnet further on past you. By ‘barrier’ we mean a place that people are likely to stop at when they get there, and probably not travel on further past it. Barriers can be both positive and negative in form. A small/medium town is likely to be a positive barrier, because most people when they reach the town are likely to stop there, at least for a while, or until such time as the town is overwhelmed (and possibly destroyed). A river with no bridge is clearly a negative type barrier. Magnets are places people are likely to want to travel to. A magnet might be a well-known resort area or settlement. For example, perhaps a lot of people from California might decide to go to Lake Tahoe – in such a case, you’d want to be sure you weren’t between I-80 and the lake, because if you were, you might have too many people traveling past you, and many deciding to stop when they stumble upon you. A magnet might be an appealing town or region that people for whatever reason feel would be a good location to find refuge and support – whether this is necessarily a rational choice or not. Maybe someone saw a brochure for a Sun Valley, ID resort, and they decide to go there – so you’d not want to have a retreat too close to Highway 75 as it makes it way up from I-84 to Sun Valley (which is a bit of a shame because there are some otherwise interesting locations in that region). These two examples incidentally point out that not only major connecting routes may be well trafficked – some unlikely secondary routes may end up with more traffic than you might think, due to the presence of a ‘magnet’ somewhere along them. It should go without saying that not only do you want to be a certain physical distance from well-traveled routes, but you also want to be out of sight of the routes as well. You want to have a land barrier between you and the route. Other buildings are not a good form of barrier, because buildings and other signs of human inhabitation are magnets. The sight of buildings will draw people to them. Trees are okay but not great, and particularly at night, light from your retreat might be seen through the trees. Simple distance by itself is okay, but if you are on reasonably level ground, you need quite a lot of distance to be secure and ‘invisible’. If we say the highest point of your retreat roof is, say, 40 ft above the ground, and if a person is standing a little above ground level at the far away point – on a slight rise or something, then the distance you have to be apart so as to have the horizon caused by the earth’s curvature block your roof line from their sight is in the order of 12 miles. That doesn’t mean 12 miles from the freeway. It means 12 miles from the closest point a person is likely to travel off the main thoroughfare on a semi-random basis, which we earlier suggested would be somewhere between a half day and a whole day’s travel from the thoroughfare. The best way to be out of sight is to have a hill between you and the main thoroughfare. The hill not only obscures you, but discourages people from traveling in that direction, too. Distance – whether needed or not – also protects you from other giveaway indicators of your presence – the unavoidable smells and sounds of your retreat. In our article ‘Four Waves of Food and Shelter Seekers‘ we categorize people fleeing the cities into four categories. The first three waves of people will be traveling along the highways in the month or two or three immediately following whatever catastrophe it was that occurred. But the fourth wave – which is by far the most threatening of the groups – will be roaming about the country on an ongoing basis. Long after ordinary people’s cars have run out of gas or failed, there will still be roving gangs of evil-doers, probably in mechanized transport, and if not, on horseback, looking to opportunistically loot and nihilistically destroy whatever they come across. They will probably be regionally based, and so will get to know their local home turf, and remaining obscured from these people will be your greatest challenge of all. While they’ll travel on what remains of the major arterials to cover longer distances efficiently, when they’re scouting for new targets to attack, they’ll systematically fan out every which way from the major routes. But that brings us to an entirely different topic – one of defense, and we cover that in its own category. When choosing a retreat location, you want to consider not only distance from major population concentrations, but also distance from major routes that refugees are likely to travel when the inevitable exodus out of the cities occurs. You want to consider not just physical distance, but also the difficulty of covering the distance between you and the routes/cities you are avoiding. A suitable retreat location should not be detectable from anywhere that refugees and roving hoards of lawless looters are likely to travel. To minimize the amount of refugee traffic in your region, you don’t want ‘magnets’ drawing people past your property on the way to somewhere else. Barriers can be both physical and impassable, or in the form of positive distractions that cause people to divert from otherwise traveling towards you.